Heel pain affects almost 15% of the population. “Spurs” are not the only cause of heel pain. Plantar Fasciitis, Posterior Tibial Dysfunction, Achilles Tendinopathy, Bursitis, Nerve Entrapments and Stress Fractures require professional treatment. Custom Orthotics, like eye glasses, are made to fit your foot and allow normal and pain free walking. Off-the-shelf arch supports sold in shoe stores are not custom orthotics and can be harmful. If you’re having foot problems, don’t delay treatment. If you or a member of your family have Diabetes, read Diabetes and Your Feet. Remain healthy and active. The American Diabetes Association suggests that all diabetics and individuals with "poor" circulation (PAD) check their feet daily. Prevent serious foot problems. Have a foot examination at least once a year. If someone you know has a hip, knee, or ankle joint replacement, unsanitary toenail care can cause infections. For Medical Nail Care make an appointment today. The medical terminology for Bunion is Hallux Valgus. 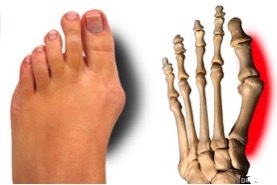 A Bunion is a deformity which occurs when the big toe moves towards the second toe. The biggest misconception is that bunions occur from an overgrowth of bone. Bunions represent a dislocation or subluxation of the big toe joint with the bone behind the great toe bulging out against the skin. Sometimes the bunion may become irritated, red or callused. Heredity and shoe gear are probably the most likely reason for you to develop a bunion. Bunions gradually develop over time. High style, tight, pointed toe shoes that crowd the toes may result in a bunion. High heels can contribute to the development of a bunion. Many foot deformities i.e. Bunions and Hammertoes occur in families and are aggravated by shoes, exercise activities, and weight gain. If you or a member of your family are prone to foot problems, let us help you prevent them. Contact us today for a complete foot evaluation. Starting a Walking or Running program? Many foot problems are related to shoes. Shoes are “correct not corrective." Selecting the correct shoe depends on the type of activity, your foot type, and most importantly, how your foot works. Let us help you select the correct shoe for your foot. If your toes are always cold, one reason could be poor blood flow. Circulatory problems sometimes are linked to smoking, high blood pressure, or heart disease. The nerve damage of uncontrolled diabetes can make your feet feel cold. Other possible causes include hypothyroidism and anemia. Raynaud’s disease can cause toes to turn white, then bluish, and then red before returning to their natural color. The cause is a sudden narrowing of the arteries, called vasospasms. Stress or changes in temperature can trigger vasospasms. Raynaud’s may be related to rheumatoid arthritis, Sjögren’s disease, or thyroid problems. This is usually a temporary nuisance caused by standing too long or a long flight -- especially if you are pregnant. In contrast, feet that stay swollen can be a sign of a serious medical condition. The cause may be poor circulation, a problem with the lymphatic system, or a blood clot. A kidney disorder or underactive thyroid can also cause swelling. Foot sores that will not heal are a major warning sign for diabetes. 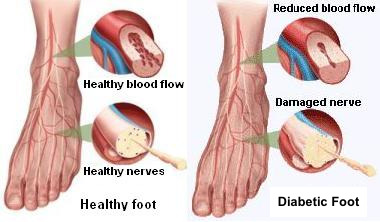 Diabetes can cause loss of feeling in the feet and decrease in circulation. Cuts in the skin or blisters may not heal normally. Sores can become infected and lead to amputation. Diabetics should wash and dry their feet and check them for wounds every day. Diabetics should see a podiatrist at the first sign of a sore developing. 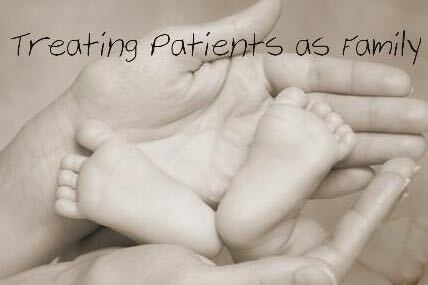 All diabetics should routinely be seen by a podiatrist. 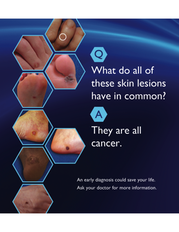 The American Cancer Society estimates that more than 120,000 new cases of Melanoma are diagnosed each year. Anyone who has more than 100 moles is at greater risk for melanoma. You need to check your feet for dark spots that suddenly appear on the foot or toes or may be enlarging, changing shape or color. Melanoma, the most dangerous form of skin cancer, can develop in areas that are not regularly exposed to the sun. 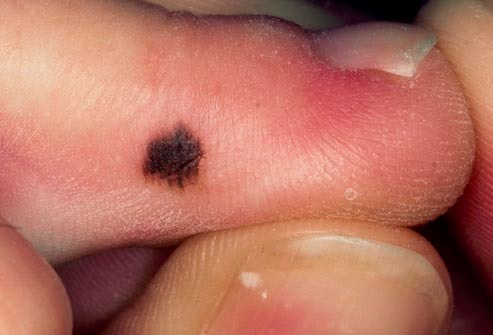 Melanoma can even appear beneath the toenail, where it might look like a black spot. If you have concerns about dark spots on the feet or toes, see your podiatrist.